Gardening isn’t just for the spring and summer months. If you’ve already harvested the majority of your crops and are now left with an empty gardening space, you may be wondering if you should do something with it. If you don’t take advantage of the fertile soil, the weeds certainly will. The weather is still nice during the day and the nights aren’t too cold yet, so why not plant another round of crops? There is still time to plant, even in September. There are plenty of veggies that actually prefer the cooler weather, and because they have relatively short growth cycles, you can get one more crop of fresh vegetables before winter sets in. Now, for some people in northern regions of the US, winter is knocking on the door and some crops won’t have time to ripen before the first freeze. In other regions, you don’t have to limit yourself to short crops. You have plenty of time to grow yummy fruits and veggies without worrying too much about a freeze. The cool wet temperatures of fall will limit your choices to plants with short growing cycles and plants that thrive in the cool weather. Covering the plants at night in mid to late October will protect them from any light freezes. • Spinach will do well in the cooler temperatures and thrive well into October. It’s a fast-growing plant that you can harvest a little at a time over a period of several weeks. • Lettuce will do very well with the cooler weather. You won’t have to worry about the lettuce bolting early or the leaves being scorched. • Radishes will be in and out of the ground within weeks, long before the first freeze. The ground will protect them from a freeze if one does happen to hit early. • Collard greens are another crop that are plentiful and will thrive in the cool fall temperatures. They need about 10 weeks to mature, so make sure to plant them at least 10 weeks before the first expected frost. • Arugula is another cool season plant. It will thrive in the moist, cool climate and be ready to eat in just over a month. • Mustard greens have very short growing cycles. You will have time to get several crops harvested before the snow starts to fall. Depending on where you are in the Midwest, you may be able to grow well into late October. However, some areas may be limited to plants that will be ready to get out of the ground in early to mid October. Covering the plants when it is expected to be cool will give you an extra week or so in the growing season. • Peas will do great. Choose varieties with short growing cycles to ensure they are out of the ground before it freezes. • Radishes are perfect for growing in the cool fall weather. • Spinach will also thrive with limited sun and cool temperatures. • Turnips have a longer growth cycle than most cool weather crops, but the ground will protect them from any light freezes. • Salad ingredients like lettuce, arugula, and mustard greens are perfect for growing and harvesting in the fall. Get in one more fresh salad before winter sets in. • Mache is one of the few plants that can only be grown in cool climates. This will be a great addition to your fresh salad. The Southwest has very few limitations on what can be planted in the fall. The warm climate, which extends well into the winter months, makes it a perfect place to grow cool-weather crops along with some of the standard crops found in gardens all over the country. • Kale will hold up very well, even if the temperatures drop below freezing. 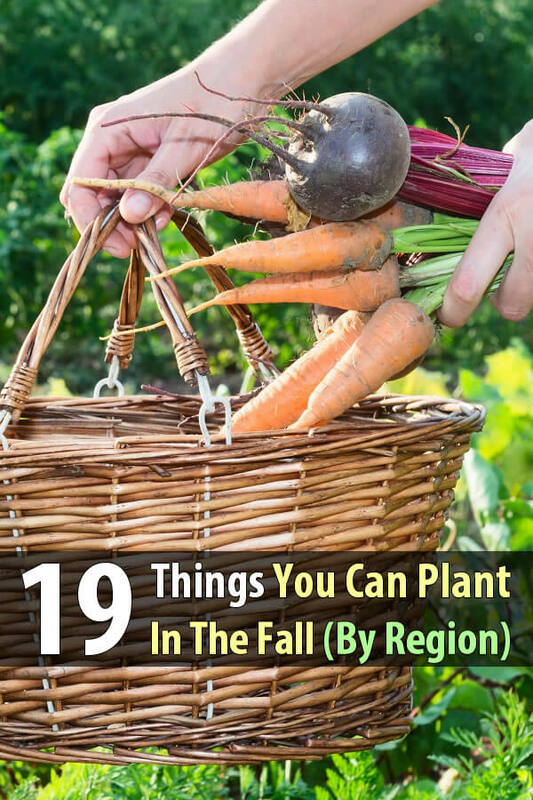 • Root crops such as beets, carrots, radishes, and turnips all thrive with the slightly cooler temperatures of fall in the Southwest. • Leeks will do well, but it’s best to start them indoors before transplanting them outside. • Cauliflower will thrive, but only when started indoors first. • Broccoli won’t bolt too early from excessive heat, which tends to be an issue for Southwestern summers. Start indoors first. • Lettuce varieties will do well, but if the temperatures are still high, you may want to hold off until mid to late September before planting. • Brussels sprouts transplants will be a nice addition to the fall dinner table. • Swiss chard will continue to grow throughout the fall and winter if the temperatures are mild. You will always have fresh salad greens with this beautiful plant. In this region, the early winters and cool temperatures limit the vegetables that can be grown without the protection of a greenhouse or cold boxes. However, there are a few plants that will do okay. • Spinach started right now will grow just fine and even give you a few harvests before it freezes. Cover the spinach at night to protect it if you suspect it may freeze. • Lettuce varieties will do great with the cool temperatures. You can expect sweet, crisp lettuce with the cooler weather. • Arugula is another plant that can withstand the cooler temperatures and limited sun and still thrive. • Mache will do great well into October. If you suspect a light dusting of snow, cover the plants and uncover them once the snow has faded. The extended summer extends the growing season quite a bit in this region. You can grow a lot more than the standard lettuces and leafy greens that most of the other regions are limited to. • Broccoli will have plenty of time to mature. The key is to use starts. Start the plants indoors or buy starts from a nursery. • Carrots will do great with the slightly cooler temperatures. The ground will still be warm enough to produce plenty of crunchy, sweet carrots. • Cauliflower will need to be started indoors first and then put outside to mature. You won’t have to worry about extreme heat wilting and turning them pink from too much sun exposure. • Bok choy will appreciate the slightly cooler temperatures of the fall. • Cabbage will mature within 60 days and be out of the ground before the first round of freezing temperatures hit. • Beets are another root crop that will thrive in cooler weather, so you won’t have to worry about the crop being ruined by cool night temperatures.